Whether called target, targa, targo, or targe, it’s a round shield ranging from approximately 18”–21” in diameter, used by infantry forces in various European armies from the 13th through the 16th centuries. Constructed of wood and usually wrapped with leather or rawhide, it was designed for close quarters combat and offered good protection for its size. 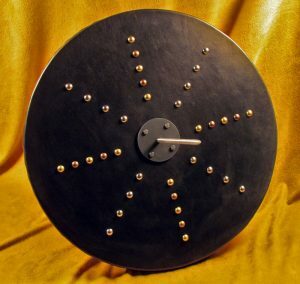 The Scots developed a unique style of this type of shield, and the Scottish variety is called a targe. Although most did not have a spike, spikes were not uncommon. They were traditionally made from two or three layers of hardwood laminated with glue and wrapped with leather, using decorative nails of studs holding the leather in place. If there was a spike, it was affixed by threading into a “puddle” of lead that was poured into a boss or “umbo” in the center of the shield. The back was fitted with a pair of enarmes, one of which was adjustable. The back of the shield was often lined with a “hair on” hide, usually from a deer. If it was a spiked model it would have a leather sheath for storing the spike when not in use. When making a traditional piece, I generally use modern materials, tools, and techniques, but with a nod to the originals. I started by cutting an 18” round piece of 3/4” AC plywood. Plywood is a modern laminate that is very similar to the original. AC refers to the cosmetic quality of the surfaces. The “A” side is smooth and free of voids, while the “C” side is a little rougher. I dyed a piece of leather and used contact cement to affix it to the C side, and I used a wood stain to enhance the A side, which would be visible on the back of the shield. 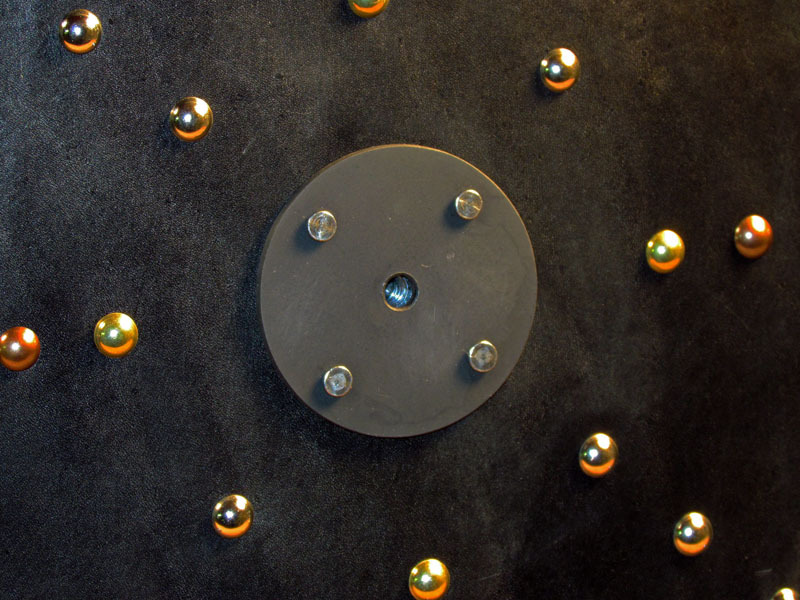 I cut tabs in the leather and used copper nails to attach it to the back. I fabricated a hand grip from mild steel, covered it with leather, and glued and screwed it to the back. The other enarme was made by modifying a belt and screwing and gluing it down. 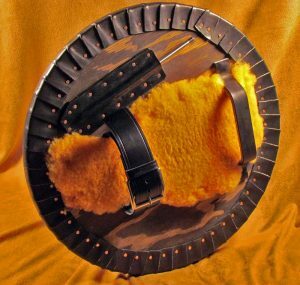 The padding is a piece of shearling wool which was tacked to the wood. 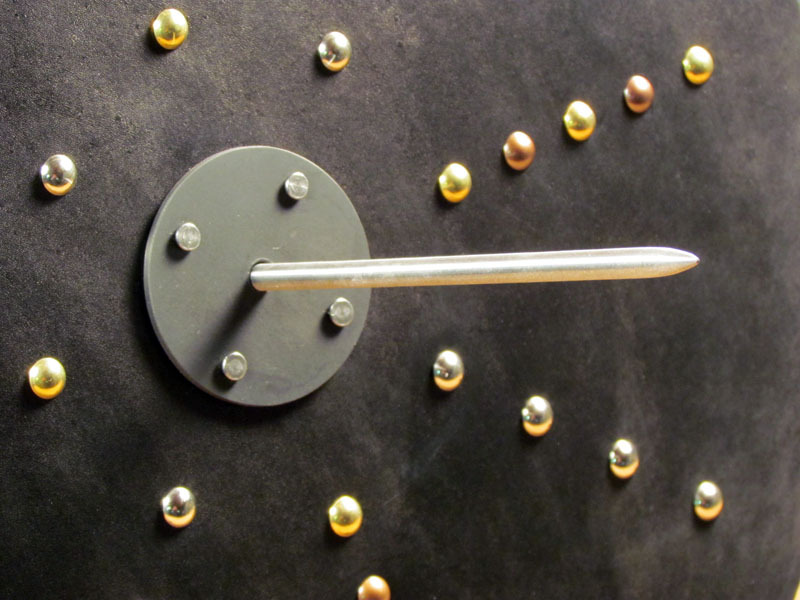 The spike is made from a 5/16” diameter mild steel rod threaded on one end and with a point ground on the other. It is affixed to the center of the shield by screwing it into a threaded insert which is attached to the wood with spikes and secured by a bolt from behind. 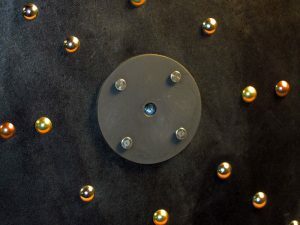 There is a round steel plate in the center of the shield which visually takes the place of the boss as well as helping to support the spike. The leather-wrapped front is embellished with antiqued brass tacks. 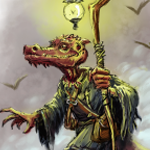 Everyone, I’m sure, is familiar with duel wielding. You have probably had a PC with this skill. It’s pretty cool, right? But how cool would it be to triple wield? I’m going to do a follow-up piece and show you how, with a spiked targe, triple wielding is not only possible, it was actually done. No tricks—three weapons and a shield. I promise. Triple wielding sounds like fun and worth a Feat! Very lovely piece of work. These were used by the specialist targeteers. weren’t they? The sword and buckler soldiers set in to exploit weaknesses in field fortifications or pike blocks? My research showed they were used fairly consistently as general purpose infantry. So they would have been effective against pike formations; able to get past the points and at the pikemen. (claymore and flamberge were used for this also). Bucklers are actually quite a bit smaller, usually all steel, and with one enarme. I haven’t looked into it thoroughly yet, but I believe they were normally paired with a broadsword.